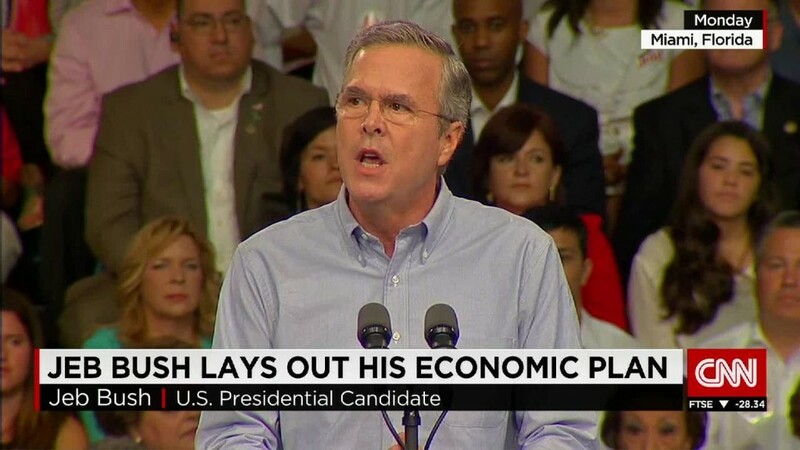 Jeb Bush caused quite a stir when he said Americans need to work longer hours to gain more income for their families. "Workforce participation has to rise from its all-time modern lows. It means that people need to work longer hours and through their productivity gain more income for their families. That's the only way we are going to get out of this rut that we're in," the Republican presidential candidate said in New Hampshire Wednesday. Actually, Americans already work pretty hard, especially when compared to their peers. 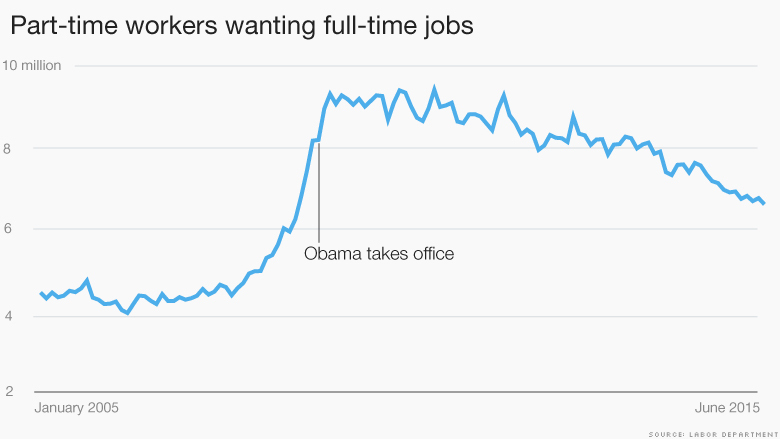 And while some would like to work more, the number of part-timers shifting to full-time work has been on the rise. CNNMoney gives you a little more context about the American worker. Americans do work hard. 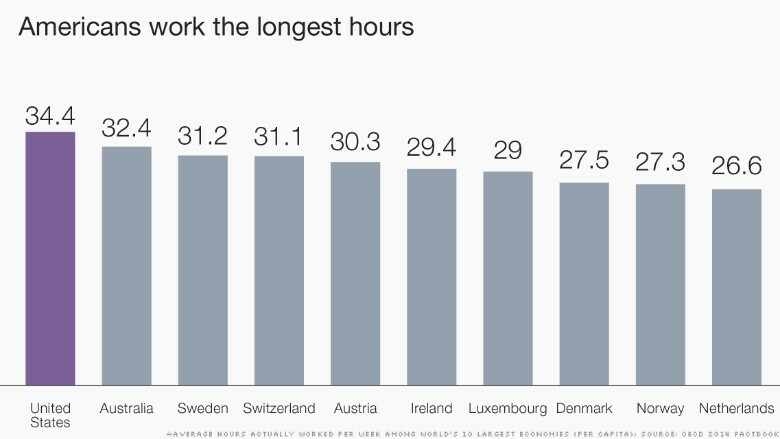 Americans work an average of 34.4 hours a week, longer than their counterparts in the world's largest economies. Many work even longer. Adults employed full time report working an average of 47 hours per week, which equates to nearly six days a week, according to Gallup. That's about an hour and a half more than they reported a decade ago. Americans also receive fewer vacation days than their peers elsewhere -- and they don't even take all the time they are given. U.S. workers got about 15 days off in the past year and took 14 days, according to a 2014 Expedia.com survey. Europeans are given an average of 28 days, while workers in the Asia-Pacific receive 19, though they also don't take them all. Americans want to work more. After his initial remarks, Bush later said that he wasn't suggesting that full-time workers should be working more hours. Instead, he wants those stuck in part-time jobs to be able to find full-time jobs if they want to. "You can take it out of context all you want, but high sustained growth means people work 40 hours rather than 30 hours and that by our success they have disposable income for their families to decide how they want to spend it rather than standing in line and being dependent upon government," Bush said. He's right. The number of part-time workers who want more hours is high by historical standards. There were 6.5 million such part-time workers in June compared with 4.4 million ten years ago. But the higher number of part-time workers is a remnant of the Great Recession. The large spike occurred in the final months of former President George W. Bush's time in office. The problem has actually abated somewhat during Obama's tenure, falling from 8 million the day he took office. Many of the part-time workers find the hours they're seeking by working more than one job, though the percentage of workers who have multiple jobs has also declined in recent years. There are also nearly 2 million jobless Americans who would like to work but have stopped looking for a job because they've become discouraged or face some other problem, such as lack of transportation. But as is the case with part-time workers, that number has been falling in recent years from a record high of 2.8 million in January of 2012. 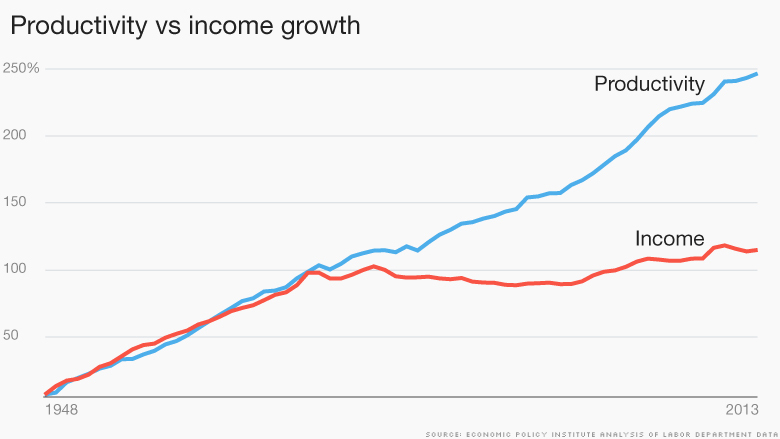 Productivity gains are great -- but haven't been leading to income gains. Bush's solution for raising family incomes, and spurring economic growth -- more productive workers -- isn't working any longer. Traditionally there was a link between how much goods and services workers produced and how much they were compensated. Essentially the more businesses were able to sell, the more they paid their workers. From the end of World War II to the early 1970s, growth in one measure nearly mirrored the growth in the other. But since the early 1970s, the two measures have split severely. Productivity has continued to grow, but wages of most workers have stagnated when controlled for inflation. Analysis done by the Economic Policy Institute, a liberal Washington think tank, shows productivity growing 240% between 1948 and 2013, while wages of non-supervisory workers grew only 108% during the same period. There has been little gain in real wages of those workers since 1978. There are many reasons for the split. More of the gains of businesses have gone to corporate profits rather than to wages. Downward pressure from competition of overseas workers, a reduction in union bargaining power and increased automation reducing the need for workers are all factors according to EPI. So is greater wage inequality, with top earners, such as CEOs and Wall Street workers. getting a larger share of wages.